Joseph Carruthers doesn't feel like a hero and says he didn't have time to think when pulling Alicia Szostak-White from her burning SUV. Joseph Carruthers said he would like to meet the young woman whose life he saved by pulling her out of her burning vehicle early Tuesday. But for now, the 27-year-old Naples man downplays his bravery and remains humble, even while the police, and his friends and family applaud his actions. “I don’t feel like a hero. I’m just an everyday guy,” Carruthers said several times Thursday evening while standing in the driveway of his home off Harrison Road, which also is known as Route 35. Carruthers agreed to be interviewed, but did not want to be photographed. He said he didn’t mind telling his story as long as his picture didn’t get published in the newspaper. 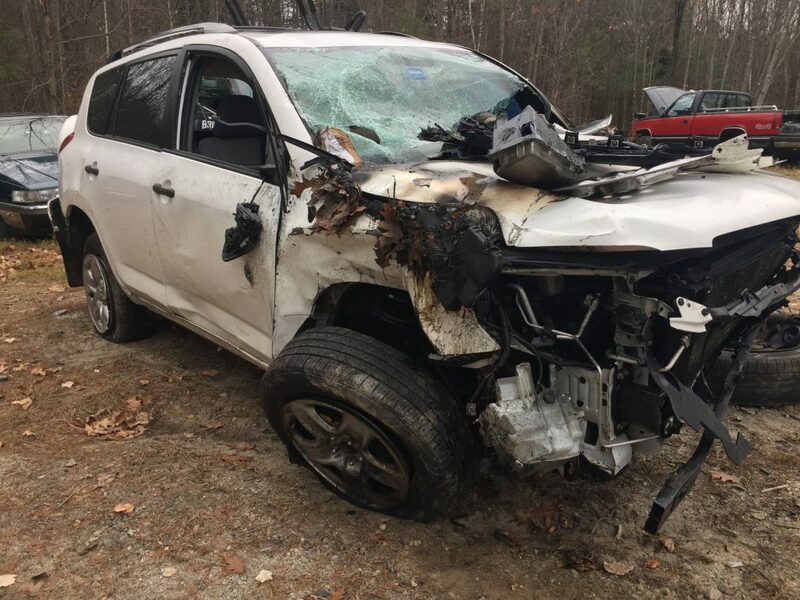 The Cumberland County Sheriff’s Office has credited Carruthers with saving the life of 25-year-old Alicia Szostak-White of Windham after she lost control of her Toyota Rav 4 when she swerved to avoid a deer. The SUV tipped over and came to rest on its side against tree. A short while later, the front engine compartment caught fire and that is when Carruthers and several of his neighbors sprang into action. Carruthers looked out his bedroom window, saw bright headlights and then went to the kitchen where he met his father, 51-year-old Kenneth Carruthers. His father was getting ready to go outside, so Carruthers threw on a pair of pants and a hooded sweatshirt. Father and son raced several hundred feet to where they came across Szostak-White’s burning vehicle in their next-door neighbor’s yard. The neighbor, Darlene Lord, called 911 for help. 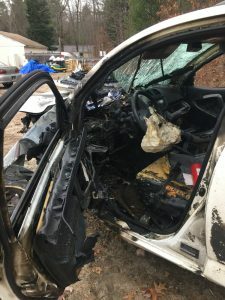 Another neighbor, Irvin Ward, was driving on Route 35 when he came upon the crash and ran over one of Szostak-White’s tires, which had broken free of its rim. That’s what caused the screeching noise. The next sequence of events sped past, Joseph Carruthers said. “It’s one of those things where you don’t think. You go into panic mode,” he said. Carruthers looked in the driver’s side window and could see Szostak-White’s face. He asked her if she was OK. She nodded yes. Meanwhile, his father ran off to get a fire extinguisher from a neighbor’s home as the flames from the engine compartment started to intensify. Irvin Ward was able to pry open the door behind the driver, which gave Carruthers, who stands more than 6 feet tall, an opportunity to crawl inside. He was able to reach the lever that allowed him to recline Szostak-White’s seat. Then he pushed the seat belt button that released the harness. His father had been using the extinguisher to keep the fire under control, but it didn’t suppress it for long. Carruthers pulled her into the back seat. “I grabbed her by the waist and threw her out,” into the waiting arms of Ward and his dad. “The last thing I remember seeing were the flames shooting 10 to 12 feet into the air,” he said. Carruthers tried to comfort her, by rubbing her back and telling her everything would be OK. He and his father left the crash scene a short while later after an ambulance crew arrived. Carruthers said he tried to give the crew his name, but they were preoccupied with getting her to the hospital. After the crash, the sheriff’s office tried to locate the father and son so that they could be recognized for their bravery. Capt. Scott Stewart said he was contacted by email late Tuesday evening and once he verified that the father and son rescued Szostak-White, he made their names public. Szostak-White was treated at Mercy Hospital and released following the crash. Her husband, Ashley Szostak, said Thursday evening that his wife was recuperating from her injuries at home, adding that she was still in a lot of pain. At some point, she would like to meet Carruthers and thank him for saving her life. When asked Thursday night why he put his own life at risk, Carruthers pondered the question for a moment before answering.